When hobbyists send their tiny, camera-equipped drones up to capture pictures of a beautiful sunset, the results can be stunning. But when unmanned aerial vehicles — which have been rapidly growing in popularity across Canada — are spotted hovering outside condo windows or over backyards, the resulting unease is understandable. But is the peeping drone illegal? Commercial use of drones falls under Transport Canada regulations and requires a Special Flight Operations Certificate. But recreational users of UAVs weighing less than 35 kilograms — considered “model aircraft” in government terms — don’t need permission from the federal department to send their remote-controlled devices up in the air. “Right now in Canada we don’t have any laws that regulate recreational drones, specifically, especially in terms of privacy,” says Ciara Bracken-Roche, a PhD candidate at Queen’s University, Kingston, Ont., and member of its Surveillance Studies Centre. In Canada, the Charter of Rights and Freedoms says “you have the right to be secure against unreasonable search and seizure,” Bracken-Roche says, noting that legal rulings around a “reasonable expectation of privacy” come up quite a bit. The key issue, though, is what recourse you have if you’re uncomfortable with a drone hovering near your property. A call could be made to the police, and perhaps they would find grounds to lay charges. “In some instances there may be grounds to lay charges if the behaviour was seen to meet the requirements under the Criminal Code for these charges. Alternatively, a formal complaint could be made to the federal Privacy Commissioner’s office. But one problem there: how to know who’s flying the drone, since the operator may well be out of sight, and the tiny machine doesn’t have a licence plate or, usually, other identifying features. It’s not the Goodyear blimp. So far this year, the Vancouver Police Department has fielded about a dozen drone complaints. Transport Canada has issued increasing numbers of Special Flight Operations Certificates for UAVs operating for commercial purposes in recent years. From 155 in 2011, the number grew to 347 in 2012 and 945 last year, the department said. The maximum penalty for operating an AUV without a certificate is $5,000 for a person, or $25,000 for a corporation, Transport Canada said. The department’s “enforcement tools” range from verbal counselling to those penalties. “What we are finding is that many operators are simply unaware of their responsibilities,” the department said, and its first approach is to talk to the operator. Such complaints come as the popularity of drones has taken off. The electronics retailer Future Shop has seen double-digit growth in drone sales so far in 2014, says communications manager Elliott Chun. Chun says Future Shop is keeping an eye out for any regulations that might arise around drones. For her part, Gersher also sees bigger privacy issues at stake around the use of drones, pointing to an instance earlier this year when the Ontario Provincial Police were reported to have deployed a drone over a group of protesters for surveillance. Concerns about drones are arising outside Canada, too. Last month, a man in upstate New York was arrested and charged with unlawful surveillance after a drone was spotted flying outside exam room windows at a hospital in Ulster. In Washington, D.C., on Friday, model aircraft hobbyists, research universities and commercial drone interests filed lawsuits challenging a government directive that they say imposes tough new limits on the use of model aircraft and broadens the Federal Aviation Administration’s ban on commercial drone flights. Back in Canada, Dany Thivierge, the founder of Mississauga-based Canada Drones, draws attention on the company’s website to safety, and urges drone users not to fly above people, houses, cars or pets. “What I always say with privacy is that today you can buy a pretty good pair of binoculars or even a camera with a big lens and you can spy on all your neighbours without them knowing … it’s quite easy, and there’s no big fuss about that. “The drone is quite noisy in the sky. It has lights. Your chances of not being spotted are pretty slim,” he says. Both Gersher and Bracken-Roche note that drones can be deployed for beneficial uses. 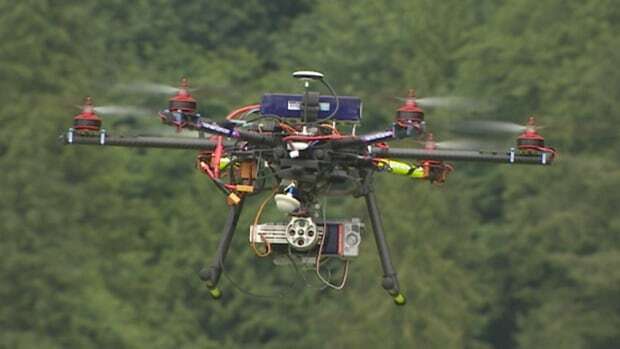 “The Canadian public at large isn’t against UAV technologies,” says Bracken-Roche, referencing data collected by the Queen’s surveillance centre for a report. “However, we must ensure that their uses and the types of equipment affixed to them fall in line within our protected rights and freedoms,” she says. Transport Canada has a UAV group that is working with industry stakeholders to recommend amendments to existing regulations, the department said in an email. But Gersher says that effort, which she says is due for completion in 2017, focuses only on safety, and doesn’t account for other types of uses.